As bathrooms become smaller, storage space becomes evermore important in order to keep daily essentials neat and tidy. Wall hung bathroom cabinets, also known as wall mounted cabinets, allow you to store away all your sprays, tubes and tubs safely whilst giving the room a stunning look. Wall mounted bathroom cabinets add huge amounts of space and style to your bathroom. With our massive range of colours and finishes you can find the perfect wall hung cabinet design to complement your setting. From stylish traditional wood cabinets to ultra-modern handle-less gloss bathroom wall cabinets we've all the wall mounted styles you need. 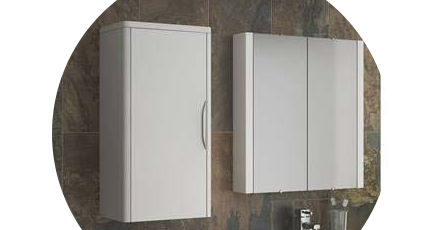 Our range of wall mounted bathroom cabinets are manufactured by a fantastic choice of top brands. You'll find only the best quality wall mounted cabinets in the latest styles built to the highest standards. Discover the perfect cabinet for your bathroom by using the shopping filters below and narrowing down your search. Good shelving I used it on my projects.